ISTANBUL — Five months ago, Selahattin Demirtas, a popular Kurdish politician jailed for his fiery speeches targeting Turkish President Recep Tayyip Erdogan, staged an unlikely challenge from his prison cell to unseat Turkey’s ruler, finishing a surprise third in the historic vote. Now, Demirtas spends his days writing fiction or preparing his defense in the dozens of prosecutions he faces as he marks his second year in prison this month. His Twitter account, from which he staged virtual “campaign rallies” and poked fun at this confinement, is silent for weeks at a time. In his absence, his Peoples’ Democratic Party (HDP), the parliament’s third-biggest grouping, has chosen new leaders but struggled to make its voice heard amid a media boycott and after thousands of its activists were arrested. A European Parliament report this week counts Demirtas’ jailing among the human rights violations that should halt European Union membership negotiations with Turkey. Chances for the country’s long-running bid to join the EU have become even more remote in the wake of a failed military coup in 2016 and the ensuing clampdown. Demirtas, his co-chairwoman Figen Yuksekdag and seven other former and current lawmakers have been in prison since Nov. 4, 2016, charged with terrorism-related offensives stemming from their political speeches. Erdogan accuses them of aiding the armed Kurdistan Workers Party (PKK) after a peace process the HDP helped the government broker collapsed in 2015, unleashing the deadliest violence in two decades. “As a very effective politician, Demirtas’ absence has created problems for the HDP. But that’s one of the primary reasons why he is being held in prison: because he was able to so persuasively convey the HDP’s goals,” said Irfan Aktan, a writer with the independent Gazatte Duvar who has covered the Kurdish political movement for more than a decade. The HDP and a sister party in the mainly Kurdish southeast have also seen 53 elected mayors jailed and a total 93 dismissed from their posts. Some 6,000 party officials and members have also been arrested, the HDP says. The PKK took up arms against Turkey in 1984, and the HDP, whose base is chiefly Kurdish, denies links with the militants. In local elections in March, the HDP hopes to deliver a rebuke to the government’s policy of replacing its mayors in the southeast with technocrats and has called for an alliance among regional parties to take back mayoral offices. But pressure on the party remains intense. Just this week, the chief prosecutor in the capital Ankara sought to strip Pervin Buldan, the HDP’s current chairwoman, and three other lawmakers of the immunity from prosecution that members of parliament enjoy. He wants to prosecute them on charges of spreading terrorist propaganda for their political speeches and posts on Twitter. Demirtas returned to court on Wednesday via closed circuit television for a hearing in one of the 28 separate trials he faces. Should he be found guilty, he faces almost 500 years in prison, the HDP has said. In September, a court handed down his first guilty verdict, sentencing him to nearly five years. 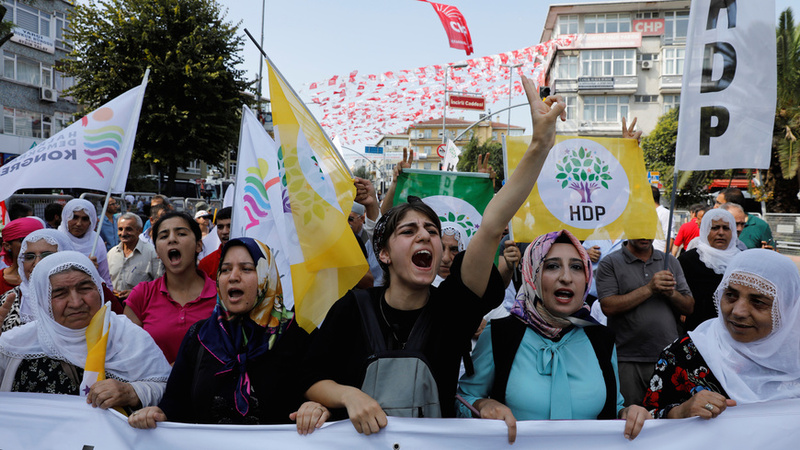 The HDP’s woes are part of a wider stifling of political activity in Turkey. Since the coup attempt, hundreds of civil society groups and media outlets have been banned, and public protests are rarely allowed. More than 50,000 people have been jailed in connection with the botched putsch. The HDP has not been implicated in the coup attempt. Erdogan won re-election in June to a new supercharged executive presidency, removing parliamentary oversight under constitutional changes. In a weakened parliament, the HDP is being even further marginalized as a nationalist discourse dominates and few mainstream news organizations cover its speeches or legislative initiatives. A former human rights lawyer, Demirtas headed the HDP and its predecessor party since 2010, gradually drawing non-traditional supporters with his progressive politics, promise to negotiate an end to the three-decade Kurdish insurgency and his sense of humor during campaigns. He led his party to a record finish in a 2015 general election, depriving Erdogan’s ruling party of a majority for the first time since 2002. Within weeks, the peace process with the PKK was over, and bloody street battles in the largely Kurdish southeast killed almost 3,000 people. Erdogan’s party retook power in a re-run election in late 2015, and the HDP’s message of a political reconciliation has been overshadowed, even as the clashes largely ended. In June, Demirtas ran for president, seeking to galvanize voters to turn out for the HDP in a simultaneous parliamentary ballot. He drew a surprise 4.2 million votes, or 8.4%, and the HDP narrowly cleared a 10% vote threshold to return to the legislature. Demirtas has written a collection of short stories in prison, and Aktan, who recently interviewed him, says he is at work now on a novel. Rights observers and foreign officials sporadically draw attention to Demirtas’ case. The report submitted to the European Parliament on Wednesday called on the commission in Brussels to immediately suspend accession talks with Turkey, outlining a litany of rights violations that include Demirtas’ imprisonment. It also called “for his immediate and unconstitutional release.” The European Court of Human Rights, to which Demirtas applied in June, must deliver a ruling in his case without delay, it said. In an interview last month, the EU’s Turkey rapporteur Kati Piri, who authored the report, acknowledged that blame also lay with the EU for failing to press the issue of Demirtas and the other jailed parliamentarians with the Turkish government more forcefully. Piri also noted that the HDP — likely overwhelmed by so many of its members in jail — appears to be advocating for Demirtas less vigorously since the election. When the party released a video last month to mark the sixth anniversary of its founding, Demirtas and Yuksekdag’s images barely appeared, prompting a backlash on social media. Posted on al Monitor November 15, 2018.